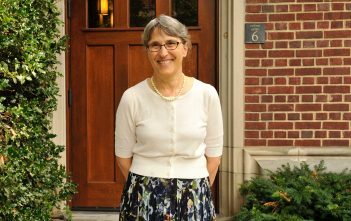 Martha Himmelfarb became a member of the faculty in 1978. Her teaching and research focus on ancient Judaism from the Second Temple period to the rise of Islam. Her most recent book is Jewish Messiahs in a Christian Empire: A History of the Book of Zerubbabel(Harvard University Press, 2017). She serves as director of the Program in Judaic Studies. “Second Temple Literature outside the Canon.” In Early Judaism: New Insights and Scholarship, ed. Frederick E. Greenspahn. New York: New York University Press, 2018. “‘Greater Is the Covenant with Aaron’ (Sifre Numbers 119): Rabbis, Priests, and Kings Revisited.” In The Faces of Torah: Studies in the Texts and Contexts of Ancient Judaism in Honor of Steven Fraade, ed. Michal Bar-Asher Siegal, Tzvi Novick, and Christine Hayes. Göttingen: Vandenhoeck & Ruprecht, 2017. 339-50. With Sarit Kattan Gribetz, David M. Grossberg, and Peter Schäfer, Genesis Rabbah in Text and Context. Tübingen: Mohr Siebeck, 2016. “Abraham and the Messianism of Genesis Rabbah.” In Genesis Rabbah in Text and Context, ed. Sarit Kattan Gribetz et al. Tübingen: Mohr Siebeck, 2016. 99-114. “3 Baruch Revisited: Jewish or Christian Composition and Why It Matters.” Zeitschrift für Antikes Christentum/Journal of Ancient Christianity 20 (2016): 41-62.